« AK-47s and AR-15s and Rocket Launchers – Oh, My! One of the BBC’s favourite tricks is to bring on guests that it knows will say the things an ‘impartial’ BBC cannot. We’ve had the ‘guest editors’ on the Today programme recently and Dr Steve Jones disparaging climate ‘sceptics’….now they bring on the clowns…or rather the cartoonists (2 hrs 45 mins)….Peter Brookes and Steve Bell….who are given free reign to vent their spleens about the government, and UKIP……..a great ruse to allow otherwise unacceptable abuse, invective and political partisanship onto the airwaves…. Jim Naughtie kicks it all off…..
Jim Naughtie: No doubt a pretty fertile year for a political cartoonist….beyond your wildest dreams isn’t it Steve Bell? Steve Bell: This government is stupendously useless, they really are and it’s amazing how everything bounces off them, they just bounce back.…this lot are not going to be re-elected. JN: Not so useless if they bounce back though? You come at this from such an oppositionist point of view that you can tear them to shreds because that’s what you want to do. SB: That’s a fair point, political cartooning is a negative thing….but there’s something peculiarly noxious about this lot, this strange sort of blend of Conservatives and Liberals. JN: Peter Brookes, you must be delving deep into the zoological books to find an equivalent these days. Peter Brookes: It becomes more difficult as these people become more ridiculous and animal like. JN: They’re a wonderful bunch for you, in all parties [see BBC impartial! ], and you’ve got UKIP coming up…that’s got to give you a field day hasn‘t it? PB: Oh the pleasure, Nigel Farage, good lord above, something slimy, something creepy, something desperately unpleasant…..something reptilian. JN: Cartoonists can say anything.…you need them [this government] to carry on don’t you? SB: I don’t want this lot, I want them gone as soon as possible. Steve Bell of course works for the self-admitted Anti-Semitic Guardian….his own work hardly discourages that view of the Guardian…….. This is someone’s satirical view of Bell….. The BBC Radio 4 brand more or less gave up on impartiality some years ago. They now broadcast to an exclusively metropolitan liberal elite taste. Perhaps the BBC might claim they simply give their diminished band of listeners what they want. It is of course all about hipocrisy; a defining mark of this class of both listener and broadcaster is that they have the knack of nigh herculean self-delusion. Imagine if Naughtie were to ask the question of Steve Bell: Well Steve, so which party would you prefer to see in government? And what if Naughtie were to come clean about his own political instincts? The fragile BBC bubble of balance would instantly burst! Meanwhile Radio 4 takes a rather Frank Sinatra view of the past Labour Government. Mistakes they made a few – but then again, too few to mention. Not quite sure where you get the idea of a “diminished band of listeners” from, because it’s simply not true. In the latest quarterly Rajar figures, R4 achieved its second highest ever weekly reach. Well I at least have completely given up watching & listening to the BBC. If others believe what they say, more fool them. There is NOTHING the BBC broadcasts which doesn’t fit their pre-determined agenda. Since giving up being told every morning that some great political or social evil was my personal fault and the cost of meeting it was going to be at my own expense, my Blood Pressure has fallen to within the medically acceptable limits. I am now hoping to out-live the BBC. So does this piece illustrate BBC Bias or not? Forget about the little details like how many listeners BBC Radio 4 has.. I don’t think it does. Indeed, Steve Bell has throughout his career been excoriatingly vicious towards politicians of every persuasion. Search Google Images for [“Steve Bell” “Tony Blair”], for example, and you’ll get just the tip of the iceberg. I’ve never been a huge Steve Bell fan, though. I find too many of his images repetitive and more concerned with perpetuating his own caricatures than with the stories they’re meant to illustrate. Re his Middle East cartoons – I’ve always seen them as critical of the Israeli state, rather than of Jews, personally. But certainly the use of the Star of David to represent a shorthand for the state – valid based on the country’s flag, I guess – can blur the context. Well, it’s that thing again. Steve Bell has been ‘excoriatingly vicious’ from the left. Meanwhile, Nigel Farage has been ‘excoriatingly vicious’ to all three other party leaders, but no one says he’s unbiased. Honest answer, if admittedly based on no more than personal opinion (there’s a lot of it about. Imagine if another claimed the same also based on no more than wot they fink?). But this one does get a bit blurred come the tangibles at the end. Actual cartooning ability vs. the ability to render propaganda in illustration. Guessing Matt, who really does have a genius for actual satire and a non-tribal eye for prick-popping detail, was not even on their radar. Plus – Matt is consistently funny, whatever the topical issue. So he’s been critical from a right wing point of view too, then, has he? Any proof? Well no it doesn’t. Two cartoonists from papers with different political perspective and with different perspectives themselves. And nothing in what Naughtie said that comes across as biased. Indeed Alan highlights Naughtie takes care to be impartial. Although at times very good indeed, I think Steve Bell’s Israel related cartoons stray at times into the anti Semitic. Philip Roth I recall wrote rather well about the history of anti semiticism in British cartoons and Bell continues in that tradition. To be honest, while I’m familiar with Steve Bell’s work (I find it disgusting), I’m less familiar with Peter Brooks. 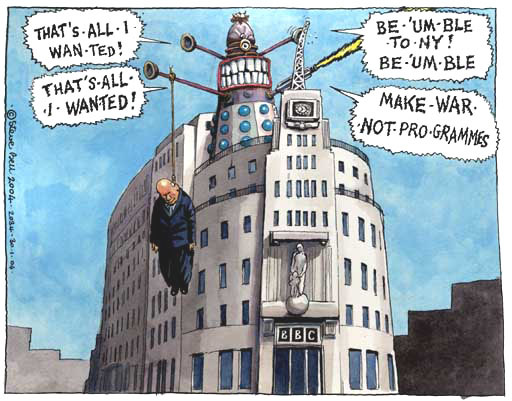 I’ve done a quick search on google and his cartoons (of which few there are) are much less offensive as Steve Bell’s. So yeah, while Bell & Brooks’ comments are fairly biased, I can’t personally see how this would be seen as BBC Bias in this case. Unless you want to consider the angle that the Today programme somehow facilitated any particular bias from the guests – either in feeding them the perfect line of questioning or, indeed, inviting two tory hating comic artists on instead of, say, one tory hating cartoonist and one labour hating cartoonist. I recall sitting in my car in a queue of traffic listening to some lefty blathering on about some made up issue and i was getting more and more angry as she was given free rein to attack and criticise this country,i ended up shouting at the radio as i had a good rant i looked across to the car beside me and the guy in that car was doing the same thing,he caught my eye admittedly a little embarrased wound the window down and asked if i was listening to radio 4 i said yes he then said f**k em! and wound the window back up. I’m not sure it is a “little detail”, though. AsISeeIt’s claims that the BBC is now broadcasting to an “exclusively metropolitan liberal elite” are the bedrock of his comment, and the figures show he’s wrong. Who’s figures are these, my friend? Do the figures come from the BBC perchance? Maybe more paedophiles are tuning into BBC now as they realise it is a safe haven? They’re from Rajar – the body that provides industry-wide listenership figures for the BBC and commercial radio stations. So its not just me being sceptical about Rajar. No, it’s true that within the industry there are those that think that Rajar’s diary-based system is imperfect and could do with improving. Many people have argued that logging stations after they’ve been listened to tends to favour those stations with greater brand recognition, whether BBC or commercial. However, given that the compilation methodology has remained unchanged for several years and so any statistical bias would be present in the data from year to year, comparing one year’s data to the previous year’s will still tell you whether listenership has risen or fallen with great accuracy. So your claim of a “diminished band of listeners” would require confirmation from another source. So, do you have an alternative source for your claim that the BBC has “diminished band of listeners” beyond your own imagination? Rajar is part owned by the BBC. I’m afraid I do not believe their figures for the popularity of Radio 4. Perhaps if there were a subscription – such as that paid by Guardian readers – then we might be able to judge. An industry-wide standards body versus an anonymous commenter who states the opposite of the truth to bolster his own argument? Hmm. Know who I trust more. Leaving aside the difficult to pin down listening figures. Do you really, really believe that Radio 4 presents a broad range of views on current affairs? A range which actually reflects the opinions of the British public? I would hazard a guess that were I to ask at the bus stop the general opinion on – lets say, Jeremy Hunt – then no one would have heard of him. And yet he is a favourite obsession of the Radio 4 crew. Out of touch. They’re not difficult to pin down. It’s just difficult for you to admit that your claim of them being reduced exists only in your head. And one programme, or one radio station, doesn’t necessarily reach everyone (although in Radio 4’s case, I think 10m is pretty good). I’m sure your hypothetical bus stop people might not be able to name all the operas in Wagner’s Ring Cycle. Does that mean that Radio 3 should not broadcast them? Depends on who’s conducting, and whether or not Jonas Kaufmann is Siegfried. Yes, but if one of them is me I’m mostly screaming at their utter arrogance and deliberate misinterpretation of the truth. That disgust forces me out of bed and away from the radio. Here’s the funniest piece of “cutting edge satire” I’ve seen for years – produced by a freelance team of amateurs on a budget of around a millionth of the BBC’s £3Bn extortion racket – and echoing the views of the majority of the population. Something you’ll never see on the Beeb. never seen the whole thing before, very good! Did anyone find them funny? Did anybody laugh? Personally I think they are identical to the ‘cartoons’ that were prevalent in Nazi Germany in the 1920’s – 30’s. wait a minute! then theres the obsession with sport and fitness, I’m beginning to see a pattern here………..
next thing you know, you’ll see itv hit back with some stupid celebrity diving program hahahaha! They do seem to like the old ‘work sets you free’ notion too. Though best I can judge is we work and they are left free Eloi-like, or indeed set free… after a period of side-stepping to allow independent impartial investigations to conclude they got it about who cares and can carry on as before. ‘The Thick of it is a comedy that satirises the inner workings of government’. Funny thing is, when I watched Yes (Prime) Minister first time around I was not really aware of tribal bias at the time, and in repeat now even less so. It simply nailed the whole pond-dwelling old boys and girls’ club of ‘governance’. Frankly Sir. Humph has never changed and Hacker could be Cameron, Clegg or Miliband. Thick and only interesting in staying in by saying anything that will buy a vote or an extra month in power. It was then satire on behalf of the people. Now such ‘humour’ is targeted at destroying foes and/or getting favoured allies back in for blatant selfish reasons. And that is acting on behalf of much narrower interests. The difference between Yes, (P)M and the rest of it (including things like The West Wing, much beloved by Beeboids) is that show had a staunchly conservative writer and a staunchly far-Left writer. Between the two of them and some very real inside baseball, they were able to create a truly balanced presentation. Not only did they manage to made it all non-partisan, but they provided a balanced perspective between the politicians and the Civil Service. Today’s shows have pretty much exclusively Left-wing writers and performers. Not only that, but Jay and Lynn were never instructed from on high to infuse their scripts with policy agendas. I had not seen some of those Bell cartoons. To deny that they are virulently anti Semitic is to deny reality. R4 can be proud of themselves. So they chose the topic, and suggested they came on to discuss, or the BBC chose the topic and suggested to them they came on to discuss? Either way, pretty effing biased, no? Funny, in all the thousands of hours listening to the BBC 1997-2010 I never heard anyhting remotely similar said about anyone in the Labour Party. Another way for the “impatial” BBC to get its message across is through puff pieces about the right people (who are, of course, left). Anyone hear Radio 4’s piece on Rachel Carson the “founder” of environmentalism. No hint of her responsibility for the deaths of millions. It is worth noting that “The U.S. Department of Agriculture, the federal agency with responsibility of regulating pesticides before the formation of the U.S. Environmental Protection Agency in 1970, began regulatory actions in the late 1950s and 1960s to prohibit many of DDT’s uses because of mounting evidence of the pesticide’s declining benefits and environmental and toxicological effects.” This was some 12 years before the publication of Carson’s book. Research has also shown that, due to its widespread use, resistance to DDT increased significantly. This questions whether its continued long term use in combating malaria would have been as effective as previously.